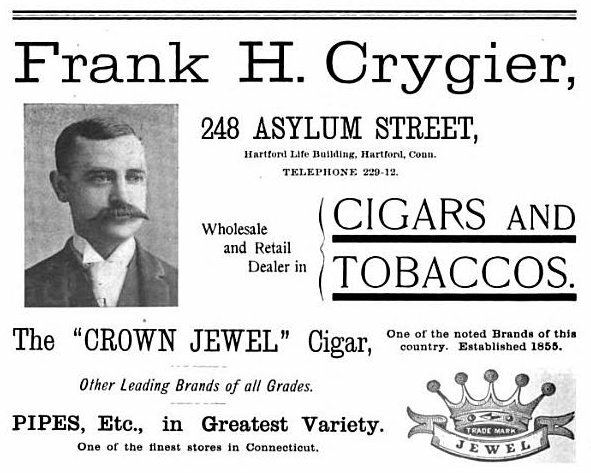 Frank H. Crygier, Hartford, Conn.
Frank Hamilton Crygier was a wholesale cigar and tobacco dealer and manufacturer located at 248 Asylum Street in Hartford, Connecticut. Crown Jewel Cigars was one of their featured brands during the 1890s and early 1900s. Crygier was born on August 21, 1856 and died October 5, 1914. Little esle is known about Crygier's life. He is buried in the Cedar Hill Cemetary in Hartford County, Connecticut. Henry T. Offterdinger, Washington, D.C. Deer Head Cigars was a product of Henry Theodore Offterdinger, a cigar manufacturer and retailer in Washington D.C. during the first quarter of the 1900s. Offterdinger was born in Lynchburg, Virginia on October 16, 1865 and arrived in Wahsington D.C. in 1878. He learned the cigar manufacturing trade under his uncle T.A. Offterdinger at 910 F Street. After nine years, he opened up his own place at 506 9th Street Northwest. The company grew and expanded to employ forty people by 1906. That year, Offterdinger patented the Deer Head brand and logo. By 1912 more expansion was completed and the company was relocated to 508 9th Street inside a newly built five-story building with room for 200 employees. Offterdinger was said to have used "only the choicest blendings of rich Havana tobaccos" in making his cigars. Offterdinger was also noted as being president of the Patent Fin Hot Water Heating Company, along with numerous other business ventures. The H.T. Offterdinger Radiator was patented in 1907. The date of his death is unknown. 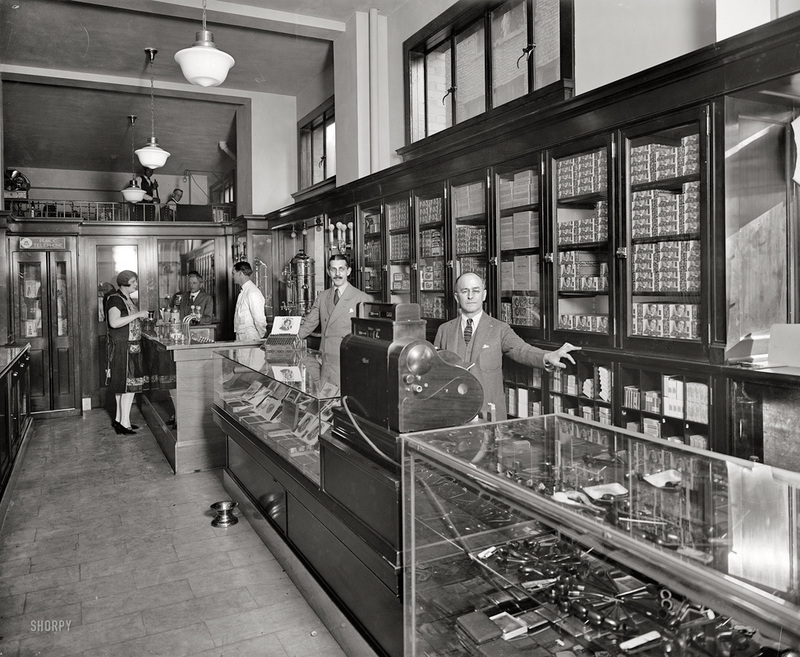 Elmore Daniel Heins opened the Heins Cigar Store in 1911 at Campbell Avenue and Jefferson Street in Roanoke. The 1912 History of Roanoke County reffered to Hein's as "one of the progressive young businees men of Roanoke." Heins was born in Cincinnati, Ohio on December 8, 1885 and moved to Roanoke around 1906. For a period of two or three years, he was sports editor of the Roanoke Times and Evening News. He was a player and member of the Roanoke Baseball Club and in 1911, was elected its president. Heins was also secretary and treasurer of the Lemon-Kola Sales Agency Company, Incorporated. He helped place Lemon-Kola syrup on the market throughout the south and east. As of 1912, the Heins Cigar Co. was considered one of the most up-to-date cigar stores and soft drink fountains in the city (History of Roanoke County). Heins died on March 2, 1962.